Hindshaw, John [sic] S., age 27, born in Iowa; miner. Henshaw, Isaac, laborer, age 36, born in Iowa; father born in North Carolina; mother born in Indiana; single; quartz miner. Hinshaw, Isaac S., head-of-household, age 57, born Mch 1843 in Iowa; father born in North Carolina; mother born in Indiana; married 11 years; occupation: saddler; rented home. Hinshaw, Freddy W., adopted son, age 17, born Dec 1882 in Oregon; father born in Indiana; mother born in Oregon; attended school 6 months. Ruoff [unclear], Frederick L., boarder, age 41, born Sept 1858 in New York; [.. parents' birthplaces unclear ..]; single; occupation: salesman. Hinshaw, Julia A., boarder, age 52, born Feb 1848 in Iowa; father born in Ohio; mother born in Pennsylvania; married 11 years; 1 child, none living; [.. occupation blank ..]. 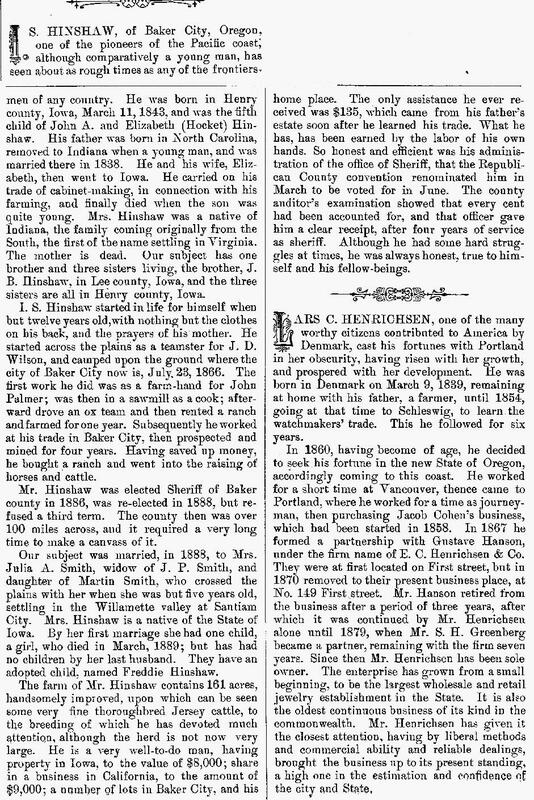 HINSHAW, I. S., of Baker City, was born in Henry County, Iowa, March 11, 1843, and has made his own way since twelve years of age. In 1866 he came to Oregon, and after working at various things embarked in cattle and horse training in Baker County, which he still carries on successfully. In 1866 he was elected Sheriff, and again in 1888, declining another nomination, but received it again in 1892. He has been a frequent member of conventions and central committees. Another biographical sketch was published in the 1893 "An illustrated history of the state of Oregon"1 (see scan below). "An illustrated history of the state of Oregon", Rev. H.K. Hines; Chicago: The Lewis Publishing Company, 1893; http://www.ancestry.com. 1870 census, Baker City P.O., Powder River Valley, Baker County, Oregon; roll M593-1285, page 34, line #29, dwelling #15, family #15. 1880 census, Pocahontas Precinct, Baker County, Oregon; roll T9-1080, ED 1, page 13B, line #34, dwelling #20, family #20. 1900 census, Baker City, Baker County, Oregon; roll T623-1345, ED 162, page 24B, line #69, dwelling #478, family #515. "Oregon Marriages From 1806 to 1850". http://abish.byui.edu/specialCollections/fhc/newMarriage/searchForm.cfm (marriage book pg 57). 1900 census, Baker City, Baker County, Oregon; roll T623-1345, ED 162, page 24B, line #85, dwelling #480, family #517. Oregon Death Index, 1903-1970; Ancestry.com. death record of Isaac Hinshaw, son of John A. Hinshaw; Oregon State Archives, Salem, Oregon.